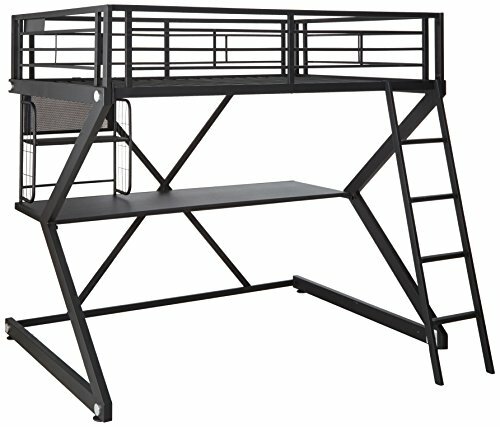 My Favorite Space Saving Cool Loft Beds with Desk Underneath! 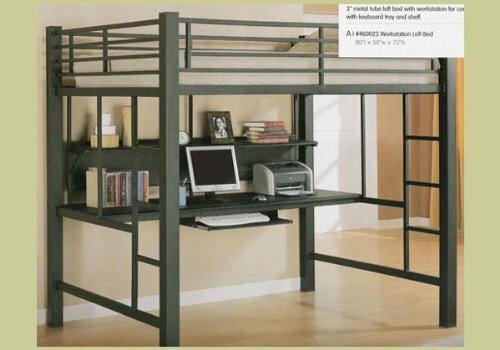 Buying a cool loft bed that comes with a cool desk underneath is one of the best ways to maximize any living/sleeping space in a small room! It is perfect for any teenager, college student or single person who lives in a small apartment! *As you can see your workstation or study space is completely under the bed! 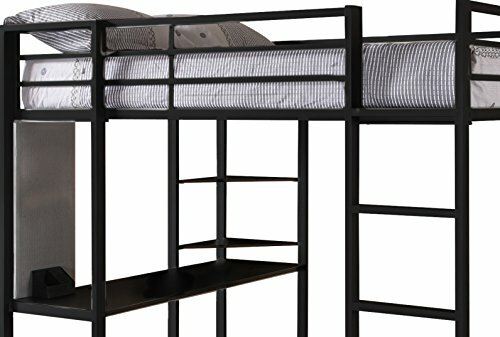 If you are an adult though, make sure you buy the sturdiest loft bed you can find, do not buy a cheap one. My sister tried buying the cheapest loft bed with desk she could find last year and she had a terrible experience! It was very wobbly and she did not feel safe at all! She ended up having to return the bed. Here are my top favorites! Very Cool Looking Loft Bed with Desk Underneath for Pre-Teen Boys! 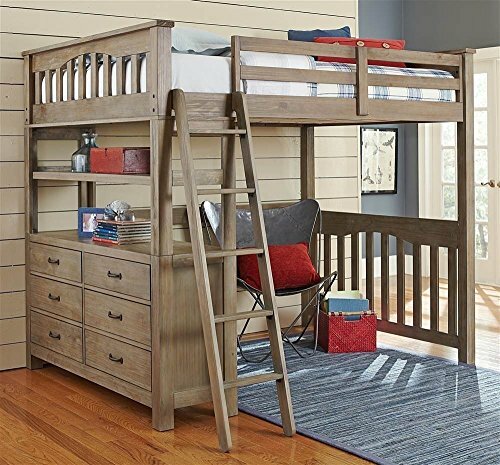 If you have a boy between the ages of 10 and 12 and are looking for a nice looking loft bed with a desk to maximize his room and make it look more ‘grown-up’ or ‘teen like’, I think you are really going to like this bed! It is very sturdy and will not wobble. The desk underneath is very spacious, just like you see on the picture. It looks very modern and definitely stylish! *The age is just a suggestion based on what some buyers said. I am sure this bed would also work for a 13 or 14 year old boy as well. 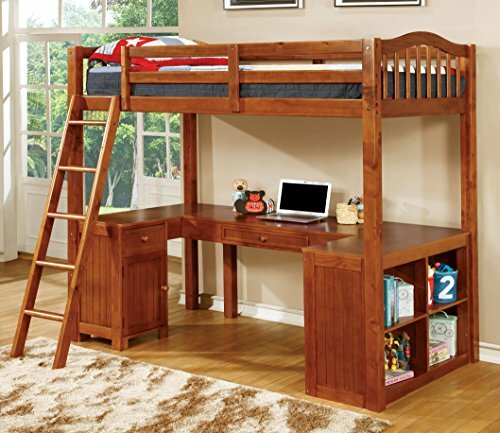 This is a gorgeous cappuccino finish solid wood twin-size loft bed with a nice desk underneath! As you can see in the picture it will fit their laptop computer, books and school material! Great for a very small bedroom as it is very compact! It’s also a sturdy bed, specially that is made from solid hardwood. I really love this gorgeous cappuccino finish! It will look amazing in any bedroom! 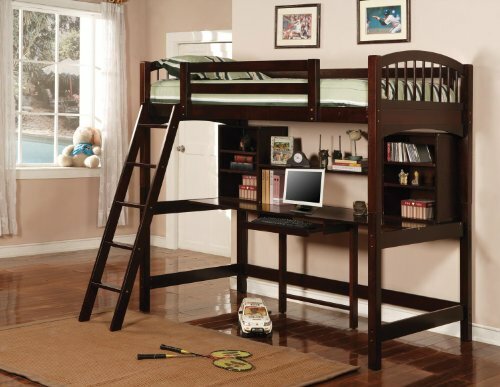 If you have a teen son or daughter and are looking for the perfect bed for her or his bedroom, I think you are going to like this very cute medium brown color loft bed with storage and a fun space underneath! It is perfect to create a nice ‘studying/reading/doing homework’ corner for them! I love the six huge drawers and nice open shelves on the side! It is the perfect solution for a small bedroom! It’s going to look very cozy and fun! It is a huge space saver! Perfect for teenagers and college students as well! If you have two kids sharing a room you can get two of these. The space underneath is also perfect for playing or maybe even creating a fun ‘reading nook’! 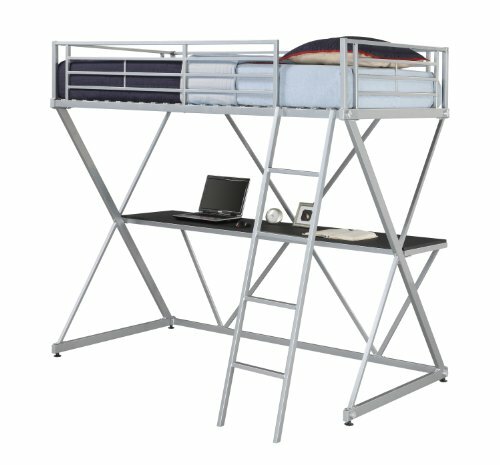 This is one of the cheapest loft/bunk beds with desk underneath around! I like the ‘clean look’! Perfect any small bedrooms or dorm rooms! And last, but not least, another beautiful wooden loft bed with desk in a gorgeous oak finish! Many parents buy two of them for kids who share a bedroom and they look awesome! Cool Loft Beds with COUCH Underneath!